A multi-stage space shoot ’em up. Fight women (“foxes”?) 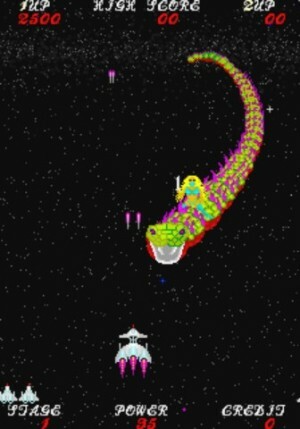 riding on dragons, eliminate a screen-full of aliens, dodge and/or shoot large asteroids, and destroy end bosses. A multi-stage game like that of Gorf. Your ship is equipped with two kinds of fire power. The first is an unlimited use shot that is slow and hard to control. The other is a limited-quantity fast shot that is much more effective. You can earn more of these fast shots by collecting power-ups released by enemies that have been destroyed. Battle against women (foxes?) riding on dragons, large “Space Invaders”, giant spiders, and huge asteroids.